Human health and the health of our planet must be at the center of how we produce and consume food. A special side event at the 2018 World Food Prize Borlaug International Symposium mapped a way forward. The World Vegetable Center is pleased to announce the appointment of two Borlaug-Ruan International Internship interns for 2018. Ms. Tyler Reid, 17, from Brandywine, Maryland, USA, will study plant genetics at WorldVeg headquarters under the guidance of Genebank Manager Dr. Maarten van Zonneveld. She has explored symbiotic plant systems through the U.S. Department of Agriculture’s AgDiscovery program and with the National Park System. 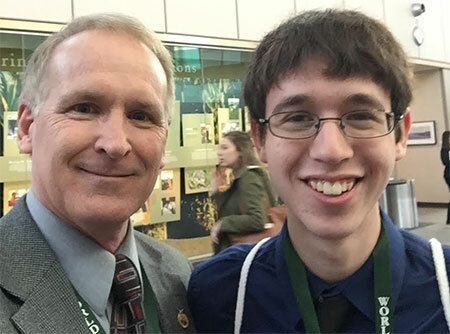 Mr. Chase Krug, 17, from Marion, Iowa, USA, has been conducting crop research on potatoes, corn, peas, and soybeans since his freshman year of high school. He will work out of the WorldVeg South Asia office in Hyderabad, India with Legume Breeder Dr. Ramakrishnan Nair and Visiting Entomologist Dr. Abdul Rasheed War. Alyssa Swehla, a Borlaug-Ruan International Intern from Iowa State University, USA, worked on a research project this summer at the World Vegetable Center South Asia to find an effective biological control agent against dry root rot in mungbean.